How does this team of spies and reconnaissance experts locate Eichmann, confirm his identity, and transport him to Israel in 1960 for a fair trial? These historic events are, of course, no small task, and the screenplay does very well interlacing these external acts of espionage with the internal emotional toll they have on the government agents who complete them. The heartbeat of this film lies in the subtle dialogue between the Nazi leader (played by Ben Kingsley, Hugo) and the Jewish Mossad agent who has captured him (played by Oscar Isaac, Star Wars: The Last Jedi) as they both play a tense, ambiguous, manipulative, psychological chess game of good vs. evil. This film reminded me of Argo (from 2012) or Munich (from 2005). It’s a well-organized telling of international intrigue, based on historic events from the 20th century, that also addresses the complexities of justice. Sometimes history is difficult to reconcile. It’s oftentimes violent and offensive. But that doesn’t mean it should be ignored or erased. 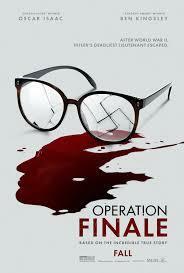 Operation Finale is a film that reminds us of the importance of history; especially the difficult parts of history.